I asked the question on Twitter, "how many teams have been better than Chicago since the arrival of Mike Magee?" Let's take a look at the results of games played since the acquisition of Magee on May 24th. I think we knew that the Fire have been good since the arrival of Magee, but just how good is pretty surprising. 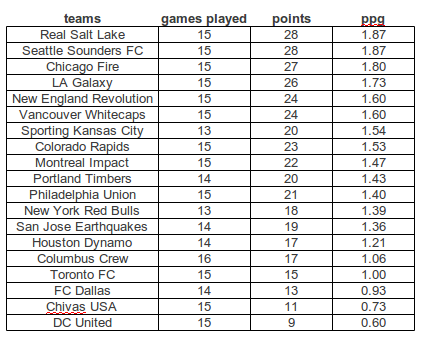 Adding to the surprise are both the Whitecaps and Revolution with 1.6 points per game. Looking to the bottom of the table we see how far FC Dallas has dropped since their hot start to the season. I know that we all like to think that the results in March and April are vital, and to a degree they are---there is no way that FC Dallas is even considering a run at the playoffs if it wasn't for how they performed in Mar/Apr---however, the season is long; there are nearly 8 months and 34 games. I've long been of the belief that one player in soccer doesn't make that big of a difference on an entire season and it's table location. Sure, maybe Clint Dempsey takes Seattle from being an injury prone playoff-ish team to a contender for the Supporters Shield. But Chicago was, and is now, much better. Along with Chicago, New England's performance needs mention too. Currently, the minute men have 17 points through 8 matches with Juan Agudelo in the line-up. Something pointed out to me by the folks over at Deep in the Fort. It's also a conclusion that makes me question how much that's true and how much a really good player can impact a season for a club. Obviously it needs a much closer observance than a single table of points over a time period. There are other factors to consider with both clubs. Regression, sample size, ect. But there is enough there to at least consider further research into the thought that some players can mean big things for the right club.